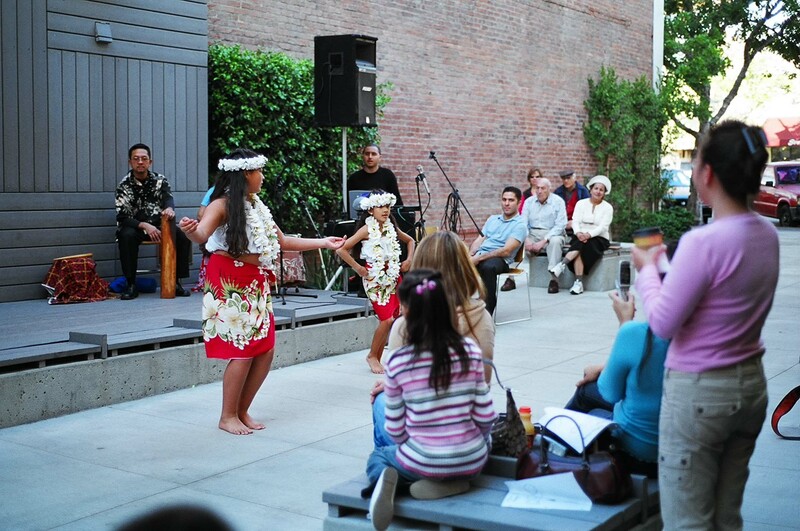 The best civic spaces perform multiple functions and Chess Park is no exception. 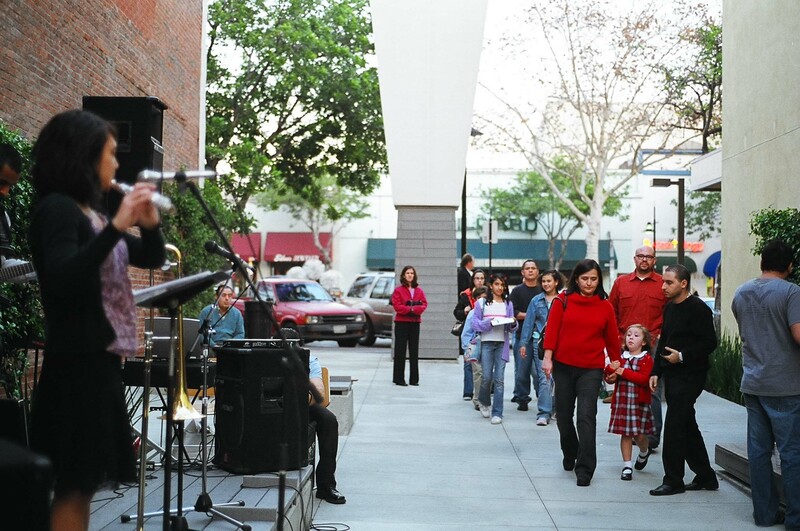 The site’s specific location makes it an important link between the Orange Street Garage and the shopping and entertainment venues located on Brand Boulevard. 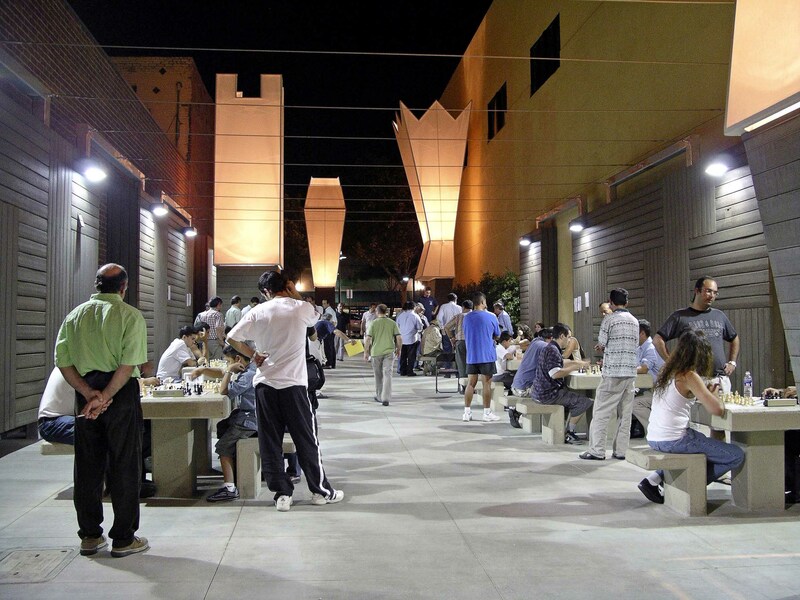 As such, the Park connects a series of civic, cultural, and business-related programs throughout the area, but it is the inspiration — a spirited location to accommodate Glendale’s sizable chess playing constituency — that brings the 4,500 square foot urban pocket park to life. 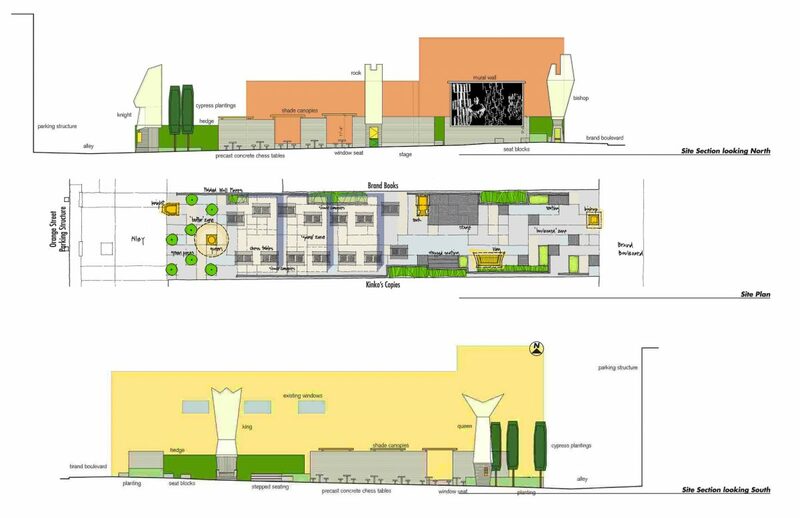 THE SPACE IS ORGANIZED INTO THREE ZONES⎯THE BOULEVARD ZONE, GAMING ZONE, AND BUFFER ZONE⎯WHICH GIVE CLARITY TO THE DIFFERENT DESIGN ELEMENTS. We began with extensive research into the game of chess, its history and multicultural roots, its connections to art and literature, as well as the specific rules and strategies of the game itself. 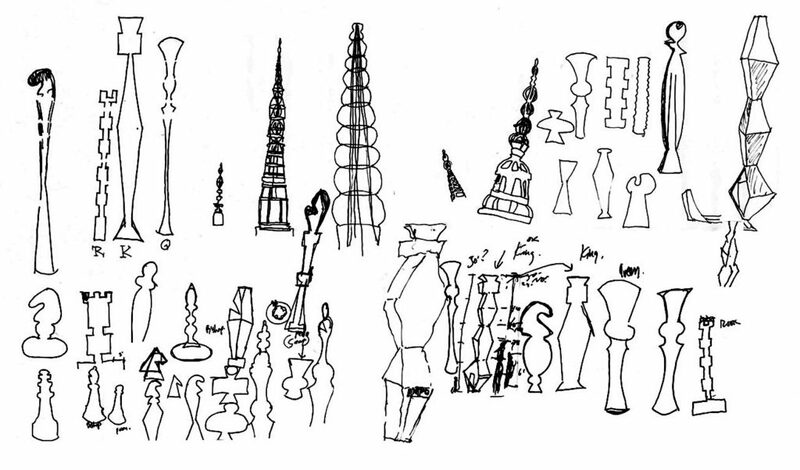 Ideas about form, function and meaning became tools in the making of each park element that would best describe the game as an instrument of culture. 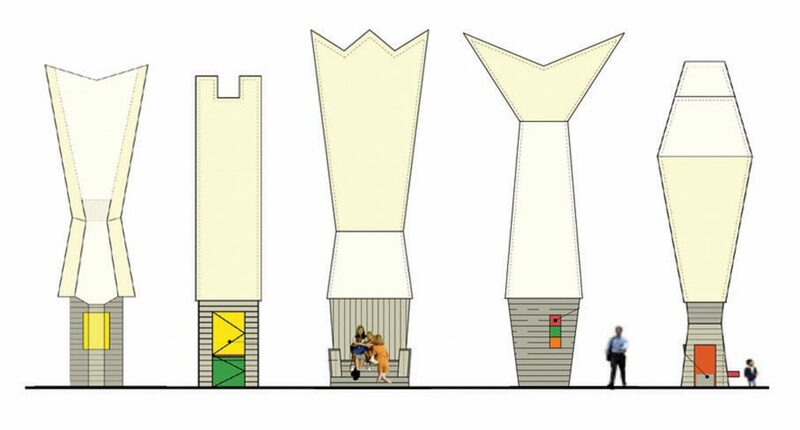 The base of each 28-foot-high lantern is constructed from TREX, a recycled plastic and wood lumber product topped with white synthetic canvas formed in the shape of an abstracted chess piece. We reinterpreted the pieces as contemporary forms to represent the evolution of ancient figurines. 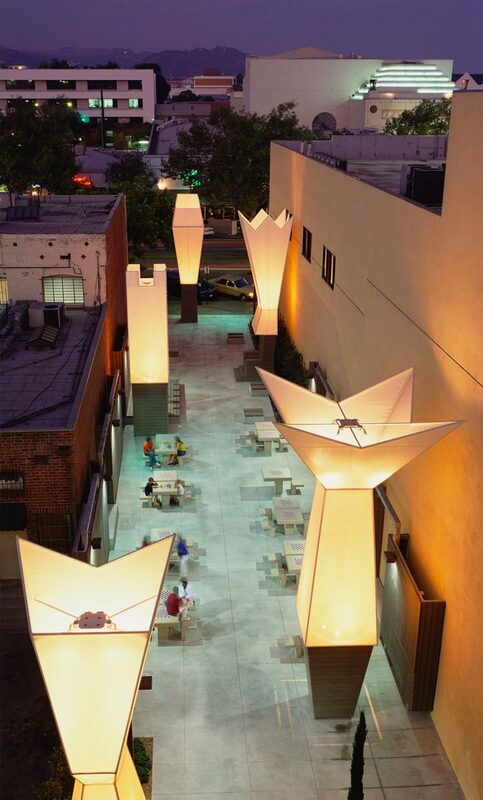 The light towers emit a warm glow and are strategically placed around the park, inspiring creativity and intellectual challenge. The Bishop Tower stands at the entrance of the Brand Boulevard zone, its role as a messenger is marked by its base carrying park entry signage. 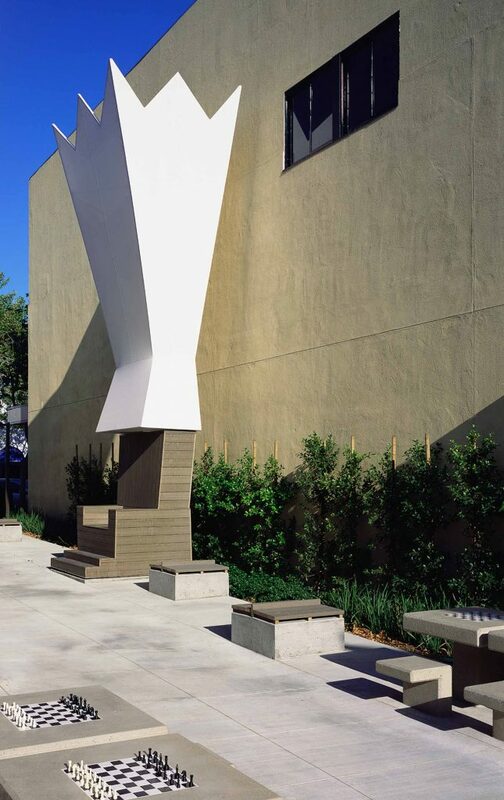 Nearby, the King Tower sits as a giant, story-telling throne where community members can engage in outreach activities such as performances and book readings. Across from the throne is a small stage platform where musicians, actors, and artists can gather together and showcase their talents. 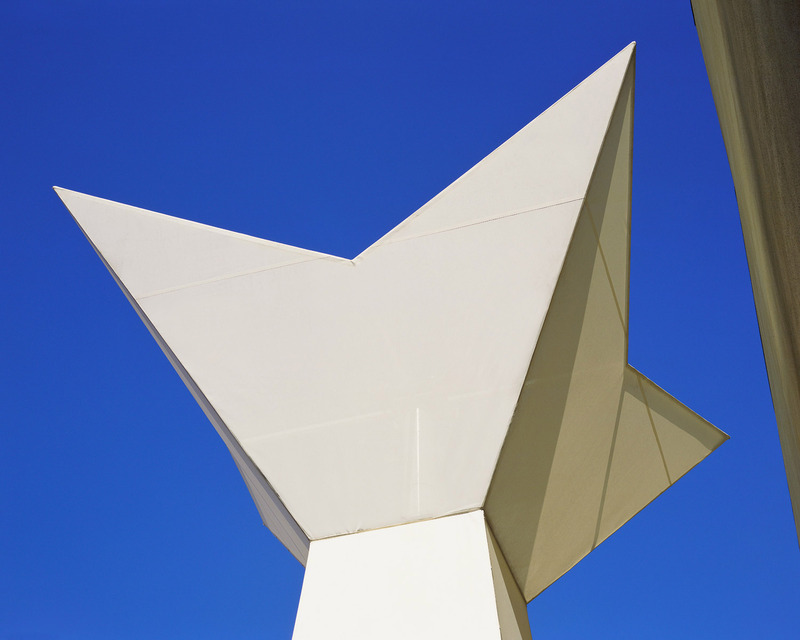 The Rook Tower, shaped like an abstracted castle, is next to the stage providing storage and technical support for events. 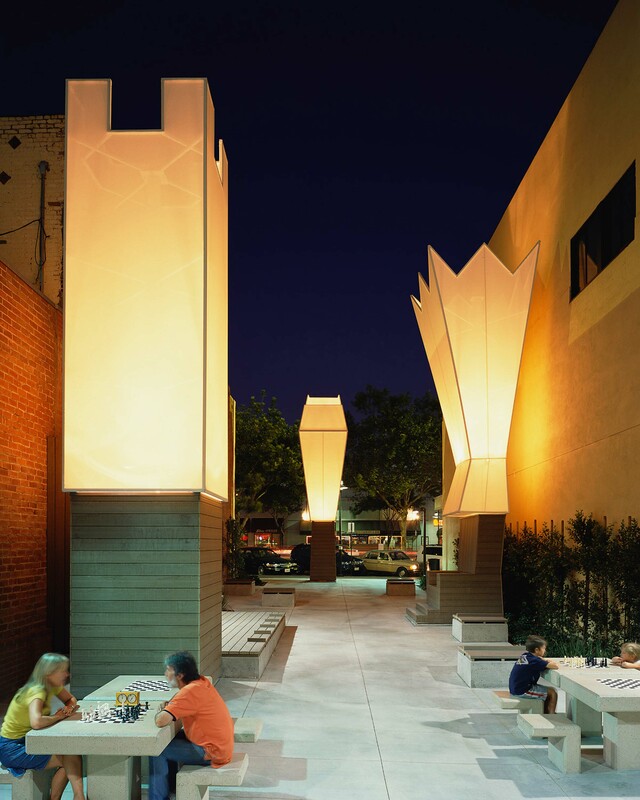 Located along Brand Boulevard in the heart of the downtown Glendale business district, the Park addresses health and safety needs, transforming a dark, underused passage between two buildings into a brightly lit and busy pocket park connecting from the garage to Brand Boulevard. 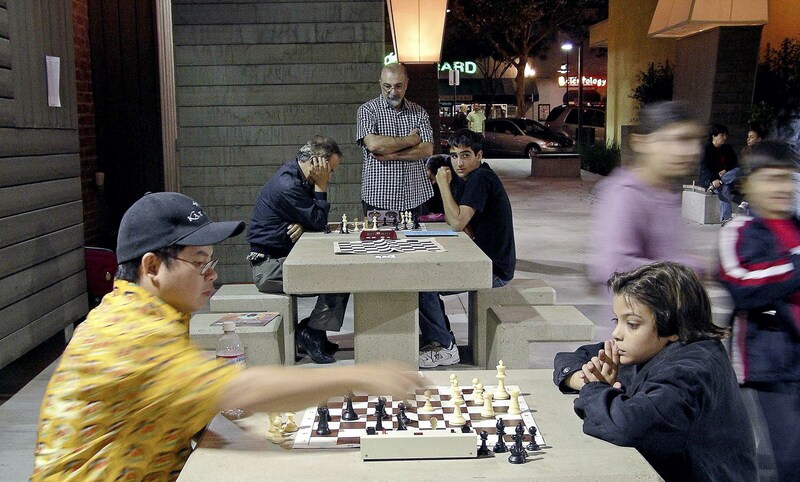 The park’s center area is designated as the gaming zone where players congregate around the 16 concrete chess tables, which feature inlaid black and white tile chess boards. 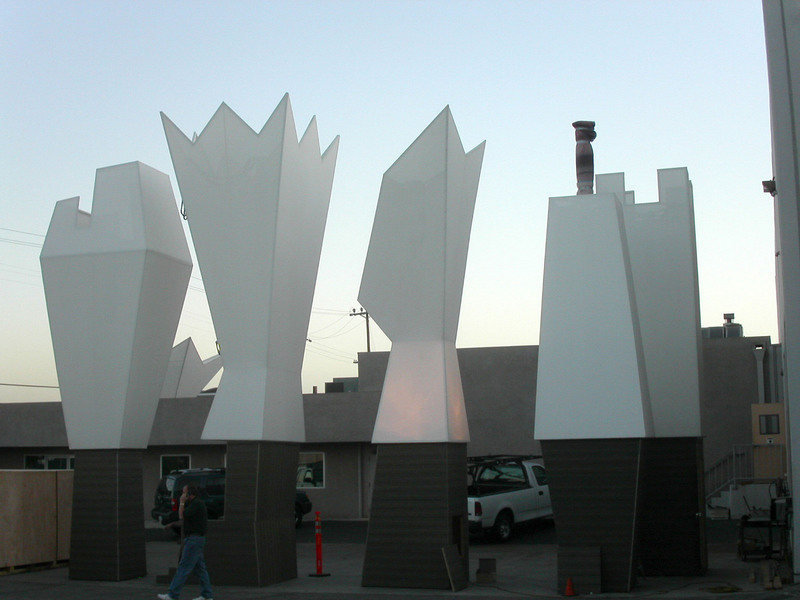 The powerful Queen Tower presides over this area and stands as a symbol for the Glendale Chess Club. The Knight Tower stands as a sentry in the buffer zone near the alleyway, vigilantly protecting the park. Patterns in the hardscape and the layout of site furnishings and landscape emulate the movement of the pieces and strategies of the game. Suggesting the folding of a board, the patterns of the ground plane “fold” up to become vertical screen wall elements clad in recycled lumber. 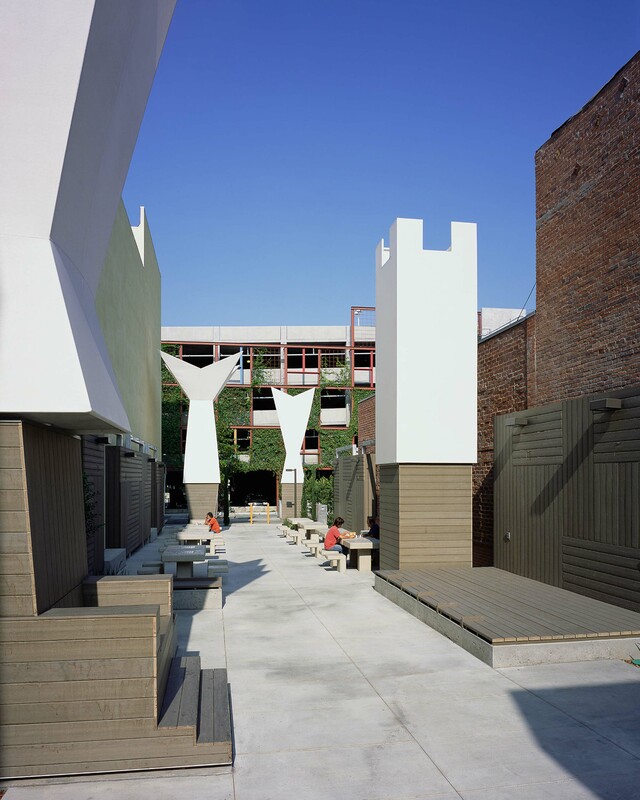 These walls provide a monolithic backdrop for the Chess Towers and the action and activities of the Chess Park. 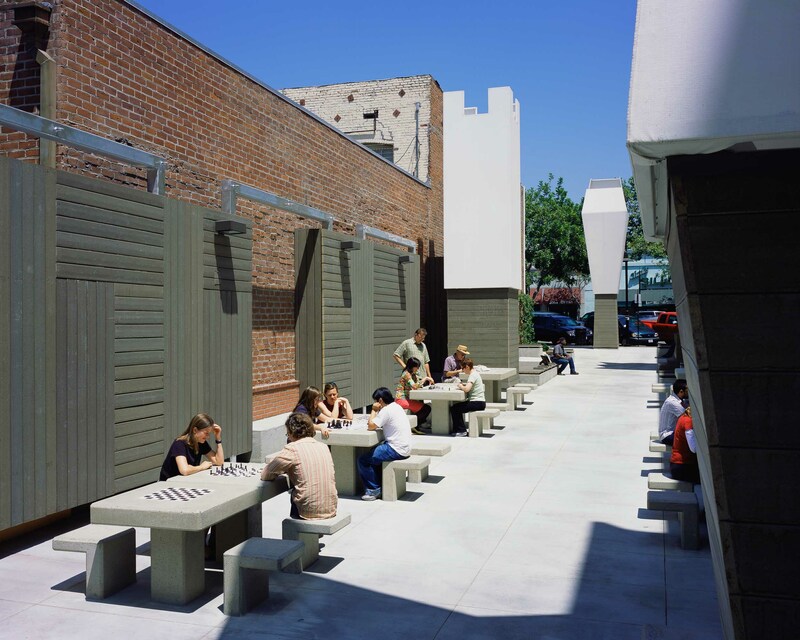 Integrated into these walls are seating, lighting, and supports for overhead canopies that provide shade for the chess tables during hot summer months. 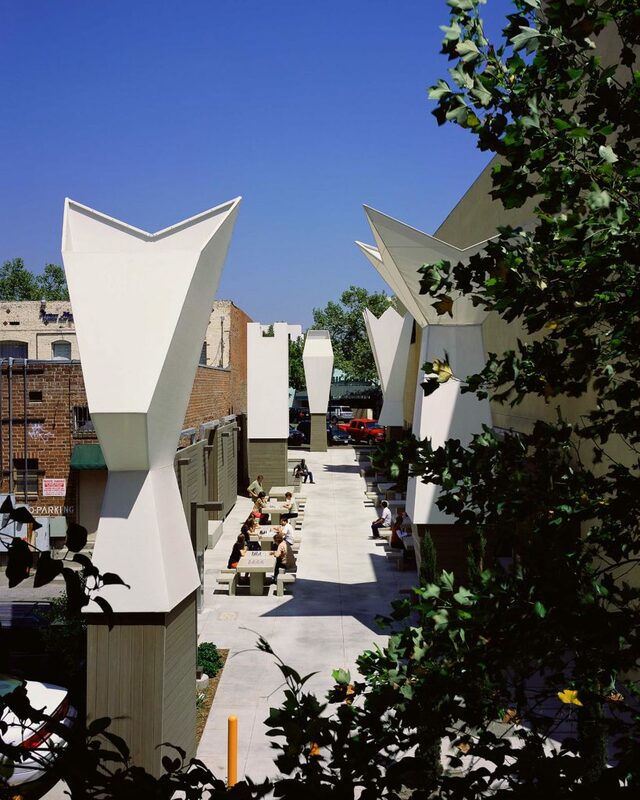 Chess Park’s landscape is composed of a series of clipped hedges and bursts of flowering perennials that extend the ideas of the vertical planes while offering blooming masses as counterpoints. The layered effect of these plantings stretches along the two long sides of the park providing an added layer of depth at the Chess Park perimeter.